More than a year ago, the Occupational Safety and Health Administration (OSHA) promulgated a new standard for addressing respirable crystalline silica. The Standard was effective on June 23, 2016, but enforcement was only to begin in the construction industry on June 23, 2017, and in the general industry on June 23, 2018. Recently, OSHA delayed the enforcement period for the construction industry respirable silica standard by 90 days, to September 23, 2017. It is important to note that the protocol set out in the construction industry for respirable crystalline silica, which is in 29 CFR 1926.1153, and the general industry respirable crystalline silica standard, which is found at 1910.1053, are significantly different. Because the construction industry respirable crystalline silica standard will become enforceable in September, this commentary will be limited to that particular standard. OSHA defines respirable crystalline silica as quartz, cristobalite, or tridymite contained in airborne particles that are determined to be respirable by a sampling device that meets the characteristics for respirable particle sizes. The action level has been set at 25 micrograms per cubic meter and the permissible exposure limit is 50 micrograms per cubic meter. The permissible exposure limit has been reduced to about 20% of the old permissible exposure limit set forth in the previous silica standard. 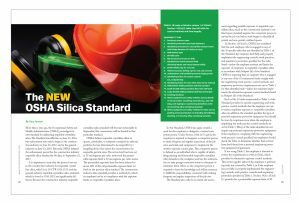 The construction industry silica standard provides 2 methods by which an employer can be in compliance with the exposure limits on respirable crystalline silica. In this Standard, OSHA has again created a need for the employer to designate a trained competent person. Under Section 1926.1153 (g)(4), the employer is required to designate a competent person to make frequent and regular inspections of the job sites, materials, and equipment to implement the written exposure control plan. This competent person is defined as an individual who is capable of identifying existing and foreseeable respirable crystalline silica hazards in the workplace and has the authorization to take prompt corrective action to eliminate or minimize them. More so, the competent person is required to have the knowledge and ability necessary to fulfill the responsibilities connected with making frequent and regular inspections of the job site. The Standard also calls for an initial site assessment regarding possible exposure to respirable crystalline silica, much as the construction industry’s confined space standard requires the competent person to survey the job site before work begins to identify all permit and non-permit confined spaces. In Section 1153(c)(1), OSHA has mandated that for each employee who is engaged in any of the 18 specific tasks that are identified in Table 1 of the Standard, the employer shall fully and properly implement the engineering controls, work practices, and respiratory protection specified for the tasks listed—unless the employer assesses and limits the exposure of employees to respirable crystalline silica in accordance with Subpart (d) of the Standard. OSHA is requiring that an employer who is engaged in any one of the 18 enumerated tasks comply with the engineering work practice control methods and respiratory protection requirements set out in Table 1 for that identified task—unless the employer implements the alternative exposure control methods listed in Subpart (d) of the Standard. 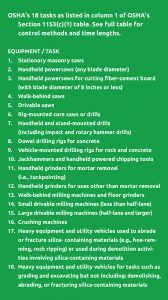 Each of the 18 tasks enumerated in Table 1 of the Standard provides for specific engineering and work practice control methods that the employer can use to reduce employee exposure to respirable crystalline silica. In addition, the standard specifies the type of personal respiratory protective equipment that should be worn by employees even when the employer is employing the work practice control methods set out in Table 1. Many of the tasks identified do not require any personal respiratory protective equipment if the employer is complying with the engineering work practice control specified, but employers should check the Table to determine whether their actions have freed them from a personal respiratory protective equipment requirement. If not using Table 1, the employer is directed to review the requirements in 1926.1153(d), which provides for alternative exposure control methods. This section applies either if the employee is performing tasks not covered by Table 1, or if the employer has not fully or properly implemented the engineering controls, work practice controls, and respiratory protection specified in Table 1. Section 1926.1153(d)(1) provides for a permissible exposure limit of 50 micrograms per cubic meter calculated as an 8-hour Time-Weighted Average (TWA). The general requirement in this section states that the employer is required to assess the exposure of each employee who is or may reasonably be expected to be exposed to respirable crystalline silica at or above the action level if tested in either the performance option or the schedule monitoring options set out in Paragraph (d)(2) of the Standard. The performance option requires the employer “to assess the 8-hour TWA exposure for each employee on the basis of any combination of air monitoring data or objective data sufficient to accurately characterize employee exposure.” Objective data is defined as air monitoring from industry-wide surveys, or calculations based on the composition of a substance, that demonstrate employee exposure to respirable crystalline silica associated with a particular product or material, or a specific process, task, or activity. The data must reflect workplace conditions closely resembling those, or have a higher exposure potential than the processes, types of material, control methods, work practices, and/or environmental conditions present in the employer’s current operations. For those familiar with OSHA’s Air Monitoring Requirements for Hazardous Materials, this is similar to a negative exposure assessment. What OSHA is telling us in this section is that the employer can either obtain the air-monitoring data of each employee performing a task in which they may be exposed to respirable crystalline silica, or the employer may rely upon objective data obtained from industry sources—or a combination of both. You must use care to ensure the objective data upon which you are relying meets the Standard’s definition of objective data and is representative of the work you are doing with the materials in question. The scheduled monitoring option provides that the employer shall perform initial monitoring to assess the 8-hour TWA exposure for each employee on the basis of one or more personal breathing zone samples that reflect the exposures of employees on each shift, for each job classification, and in each work area. The Standard does provide that where several employees perform the same tasks on the same shift and in the same work area, the employer may sample a representative fraction of these employees rather than having to sample each employee. The important thing to note here is the employer’s responsibility to perform an exposure assessment for each employee who is, or may reasonably be expected to be, exposed to respirable crystalline silica. This means that it is the employer’s responsibility to assess the work site daily—especially if other contractors will be working in the same area—and determine whether, as a result of its own work or the work of some subcontractor or the owner, its employees may reasonably be expected to be exposed to respirable crystalline silica above the action level. In making this initial assessment, you must bear in mind that the action level for exposure is only 25 micrograms per cubic meter over an 8-hour TWA—an extremely low exposure level. Subsection (d)(2)(iii)(b) further provides that if initial monitoring indicates that employee exposures are below the action level, the employer may discontinue monitoring for those employees whose exposures are represented by that monitoring. Again, please remember that your obligation as an employer under this Standard is a continuing obligation and, therefore, if conditions on the work site change to the extent that the potential exposure to respirable crystalline silica to your employees may change, you are required to do another initial monitoring. One of the other unique points of this Standard is found under 1926.1153(d)(3), which is titled “Methods of Compliance.” This Section requires that the employer must maintain its employees’ exposure to respirable crystalline silica at or below the 50 micrograms permissible exposure limit (PEL). First, the employer must evaluate the use of engineering controls to reduce exposure. Unless the employer can demonstrate that engineering controls are not technically feasible, the employer is required to implement any engineering controls that will reduce the measured exposure of its employees to respirable crystalline silica to as low of a level as possible. Please note that this Standard is somewhat unique in that it does not permit the employer to make a decision with regard to the effect of engineering controls and then determine whether or not to implement them; the employer is required to implement engineering controls if they provide for any reduction in exposure and only then may the employer rely on personal protective equipment to provide additional exposure reduction. Section 1153(e)(1) provides that when respiratory protection is required, the employer shall provide each employee with appropriate respirators that comply with the requirements of the Standard, and be in compliance with 1910.134 with regard to the employee’s ability to wear personal respiratory protective equipment. Section 1926.1153(h) sets out requirements for medical surveillance. Medical surveillance must be made available to each employee (at the employer’s cost) who has been required under this Standard to use a respirator for 30 or more days per year. I suggest that any employers who have employees who meet this requirement offer medical examinations to the employees in writing and maintain a record of the responses of employees to that offer. Section 1926.1153(i)(2) sets out the information and training requirements for employees under this Standard. Employees are expected to be able to demonstrate knowledge and understanding of the health hazards associated with the exposure to respirable crystalline silica, as well as many other details concerning the employer’s respirable crystalline silica program.